Not so long ago, just this September in fact, a mother living in the besieged eastern half of the Syrian city of Aleppo created a Twitter account for her daughter. Working in concert, 7-year- old Bana Alabed with the help of her mother Fatemah, began to chronicle her daily life in a community that has been a hideaway of Anti-Syrian government insurgents and was therefore a target of artillery and airstrikes from that same government, sometimes with even the aid of Russian military forces. Her pictures and coached words touched the world at large, which explains her over 100,000 international followers. But now it would appear that the social media may not be hearing from Bana and her mother for a long time, perhaps never again. According to CNN this Sunday December 4, Bana’s Twitter account was deactivated and deleted, without any reason given. This occurred about roughly the same time that Syrian government troops reinforced by militia forces allied with the regime of President Bashar Al- Assad have broken the defense line of rebels in the eastern half of Aleppo and have secured about 20% of its territory, starting from the northeastern corner. The Alabed Family had braved the constant shelling of their neighborhood to remain where they are, but now it’s become uncertain what has happened to them, whether they have fallen to insurgent, militia or military hands. 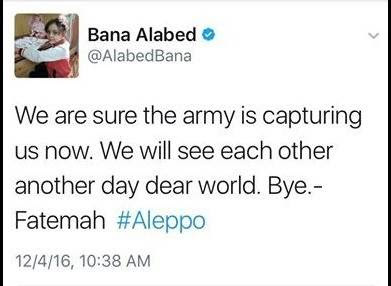 Bana’s last Tweet has made her followers fear for the worst when it came up: "We are sure the army is capturing us now. We will see each other another day dear world. Bye.- Fatemah #Aleppo"
Days before this final downer message, the Alabed’s have already lost their home in November 27, after it was hit dead on by an artillery shell. Bana, or perhaps her mother, posted a Tweet that time describing their harrowing experience, how she “almost died”, along with a picture of the Aleppo girl covered in soot with a stunned look in her face. Yet even with this stroke of grave misfortune she managed to ask for people to pray for them and the other citizens trapped in the city. Bana’s situation has managed to catch the attention of some big global names, including that of celebrated British author JK Rowling, who was impressed by how Bana remarked that reading the first book of her “Harry Potter” series helped her forget the war going on outside her door. Rowling’s agent later arranged for Bana to receive digital eBook copies of all the Potter books for Bana and her siblings to enjoy. Now nobody knows where they are. Starting Monday, Twitter messages began to flood the network, all expressing support for Bana and her family, or wishing them well wherever they might be.